Tea historians acknowledge the fact that tea was first enjoyed at cooler temperatures in the South. Due to the heat of the day, tea was allowed to cool before serving (with ice if possible-but this was rare at the time due to lack of refrigeration technology). Still enjoyed today, this was usually served with sugar (to taste), and called Sweet Tea. Unfortunately, contemporary Iced Tea has received a bum rap in the whole of the US. 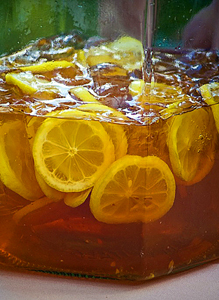 While 90% of tea’s consumption in the US is in the form of Iced Tea, commercial companies often offer syrupy, over-flavored beverages that bare little resemblance to tea. However, new ideas in iced tea are on the horizon. Instead of using loads of sugar and artificial flavor, this new tea movement retraces its steps to simple, pure, delicious tea. Thanks to the abundant availability of quality tea and good water, you can make a refreshing, healthy Iced Tea… an Iced Tea worthy to be called Tea. Although the popular standard for Iced teas is usually black teas (typically Ceylon or its cheap, vaguely-labeled “China tea” cousin), any tea can be “iced.” Next time you thirst for a frosty glass of tea, reach for something different. Great iced teas can be made from Blacks, Oolongs, Greens and Whites. Yet another idea for iced tea is not actually an iced tea at all, rather an Iced Tisane (or herbal beverage). Building upon the renewed popularity iced tea was recently enjoyed, many companies are shying away from the seemingly flooded iced black tea market, turning instead to the lesser caffeinated, but equally delicious, herbals. New beverages, such as Iced Red (Rooibos) “tea,” Iced Ginger “tea” and Iced Mint “tea,” provide a perfect alternative for the caffeine-sensitive. 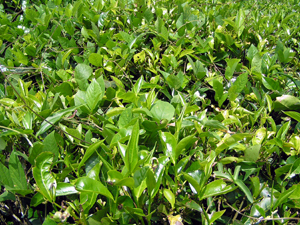 It is very easy to make Iced tea, and made from real leaves, it tastes great. To make a cup, simply double the amount of tea leaves (usually making it two teaspoons per cup of water), and steep as usual (five minutes in most cases). 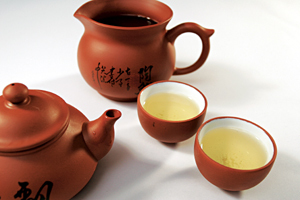 Once tea is ready, dilute with an equal amount of cold water or ice. Any way you brew it, the most important thing to remember when making iced tea is quality. 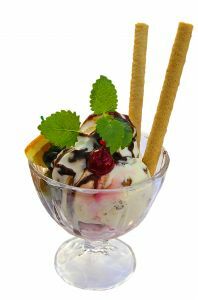 These ideas are to be utilized with this kept in mind: for the best iced tea, you’ll need the best tea. Stay cool and visit O-CHA tea bar for all of your tea needs! White Tea: What’s it all about?